Erased space in front of TIME data of saved CSV file. Supported Advance mode of WT3000. Not starting Trend display when connected to different model than the previous one. Not recognizing WT model when plugged in and out during data transmission. Incorrect vector display of element 2 and 3 current. Will not show specified current range settings. Incorrect positions and values of Element 2 and 3 on vector display of WT1600. Error message of code 666 “Media are accessed” when accesses to WT1600. Fixed to E7 and E8 of Sigma A and B under Normal Sync mode for WT3000. Incorrect vector display regarding PHI Ui-Ii value data. Freeze of file access operation under connected through NetDrive. Incorrect data of Sigma current values under auto-ranging operation. It improved the Waveform drawing function. When manual saving in Sync mode, WTID2 data can be saved as well as WTID1 (WT1600/WT3000). Corrected error of changing measurement element in numeric view (WT3000). Default setting of "AUTOSAVING" function, under the Numeric View has now been changed to always "ON" or checked. Corrected error handling between WTViewer and WT1600 during STORE operation. 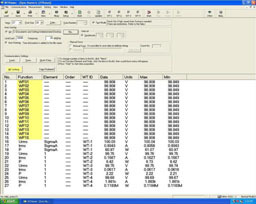 Corrected CSV File structure for data storage when using WTViewer with WT1600. Corrected displaying MATH waveform data (collected by WT3000) using WTViewer in off-line mode. Improved off-line mode operation of WTViewer with WT210/WT230. Now supports 2A/30A mixed input models when connecting to WT3000. Now supported under Windows Vista/ Windows 7 operating systems. In "Manual Save" mode, the gIntervalh setting is automatically checked "updaterate"button to assure data storage. Corrected error for autosaving integration mode. Supports COM port 3, 4 and 5 for RS232 communication. Fixed a problem in which the application software fails in RS232 communication with the WT210 / WT230. Fixed a problem in which file and screen shot are not saved when connecting the WT3000 / WT1600. Added initialize error message connecting with the WT500. Fixed a problem in which waveform is not shown correctly on the specified setting, when connecting the WT1600. Enable to use off-line mode after 30 days has passed. Fixed a problem in which the application software fails in the start, when the "Integ mode" is selected, connecting with the WT210 / WT230. Updated so that Fast Mode can be used in the Integration mode when connecting the WT1600. Fixed a problem in which displayed the screen is not correctly, when connecting the WT210/WT230 and maximum harmonic analyzed order is 30. Fixed a bug in which the Auto Naming is not effective when ACQ data are saved by net drive on WT3000. Fixed a bug in which the title or data is erroneous when saving on a model other than the WT1600 6 element model. When specifying an element other than element 1 on the WT1600 with a function not requiring element information, the display is correct but saving is incorrect if saved from the file menu. Support Crest Factor 6 mode. Corrected a defect in which measurement errors occured when connecting via RS232C. (Occurs in version 3.07, but not in version 3.06 or earlier). Changed the number of lines saved per file during auto saving to 32000. With the previous number of lines (47000), the .csv files grew too large and would cause memory shortages when opened in Excel. Furthermore, when .csv files with a number of lines exceeding 32000 are opened in Excel, they cannot be converted to graphs. Added simple explanatory text to the window that is displayed if communications fails upon startup, to the screen that appears immediately after start up, and to the Trend/Wave screen. Fixed problem in which an error message would appear even though RS COM port initialization completed successfully. To upgrade the WTViewer software program, the previous version of the software must be installed in your PC. Please read the "Software/Firmware Agreement" before proceeding to download the upgrade version of the software. Do not attempt to upgrade the trial version! Doing so may cause your PC to malfunction. Yokogawa Electric Corp. assumes no liability for damages caused by attempts to upgrade the trial version. Download the file below in zip format (wtvverupxxxe.zip). Unzip the downloaded file (wtvverupxxxe.zip).